Having the proper indexes in place is important for performance; however, on occasion indexes are created that are never used. Unnecessary indexes incur overhead for any DML. Fortunately this is a simple thing to detect. This query uses sys.dm_db_index_usage_stats. In particular it looks for indexes where no seeks, scans, or lookups occur against it. The final output of the query is ordered by the number of user_updates in descending order to identify which indexes are generating the most overhead. You’ll notice we put the results in a temporary table. This is done so we can lookup the index names against the appropriate database. In the output above we can see that user_updates are occurring on the indexes, but no seeks, scans, or lookups are occurring. A user_update occurs when an indexed column has a value inserted, updated, or deleted. From this its pretty clear to see that. These stats get reset based on the version of SQL that you’re running. Unfortunately some versions reset these stats when an index gets rebuilt. Here’s a summary of when these stats get rebuilt. I give credit to Kendra Little’s post here. SQL Server 2005 & SQL Server 2008R2 Reset on database offline/restart. SQL Server 2012 Reset on ALTER INDEX REBUILD of that index until SP2+CU12 or SP3+CU3. Reset on database offline/restart. SQL Server 2014 Reset on ALTER INDEX REBUILD of that index until SP2. Reset on database offline/restart. SQL Server 2016 Reset on database offline/restart. One additional caveat. Careful not to drop indexes from foreign keyed columns if you ever plan to perform deletes. I describe why this can be a problem in this blog post. This is a simple check you can run on your database. Removing unused indexes can reduce transaction log overhead. This is something worth exploring if you have a system showing high amounts of WRITELOG or LOGBUFFER wait. If you are using Azure SQL Database and log activity is a contributing factor to your DTU level you should definitely see if you have unused indexes – it could save you $$$! 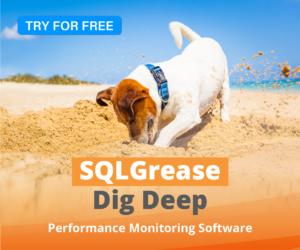 How can SQLGrease help you with fixing your deadlocks? It collects all the historical information you will need to fix your deadlocks, as well as perform a lot of the tedious work of sorting through deadlock graphs. Watch our demo to see more.